Moving house is pretty stressful – so much so that research suggests more than half of us put it at the top of our stressful life events list. I’m currently preparing for a house move later this week and even for me, the queen of planning and organisation, there’s going to be a little stress along the way. Matcha is the finest green tea leaves handpicked and stoneground into a very fine vibrant green powder. It’s said to have 137 times the antioxidant power of standard green tea, can boost metabolism and support the immune system. The great thing about matcha compared to green tea leaves is that it has uses way beyond just tea – matcha can be mixed into smoothies, baking and even ice cream. 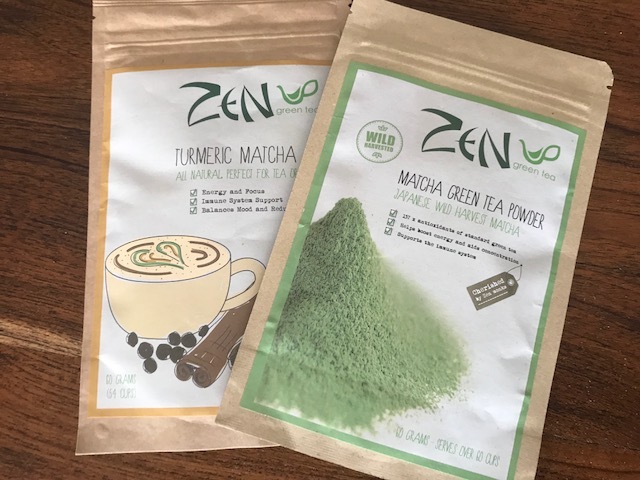 After reading about my fondness for matcha the team at Zen Matcha Green Tea sent me a couple of samples to experiment with. I often talk about supporting small Australian companies doing great things and Zen Green Tea is a great example – I love that the company was founded by a young ambitious fellow Sydneysider called Erin who was determined to make top quality matcha more accessible for Australians. Coconut oil – a fantastic source of good fats, coconut oil is made up of medium-chain saturated fatty acids. Desiccated coconut – is rich in fibre and also manganese, a trace mineral involved in calcium absorption. Carob powder – a naturally sweet alternative to chocolate that’s caffeine free and a great source of fibre. Psyllium husk – jam-packed with fibre this is a top ingredient for keeping your digestive system happy. Turmeric – contains natural anti-inflammatory powers – thanks to an active compound called curcumin. Sea salt – important for maintaining the body’s electrolyte balance sea salt is also rich in trace minerals. ** I used Zen Green Tea’s Turmeric Matcha Tea Powder but standard matcha plus turmeric would work the same. Add all of the ingredients apart from the water into a food processor. Process, gradually adding the water, to make the mixture sticky and evenly combined (but not too wet). Using one tablespoon per ball roll the mixture into tightly packed ball. 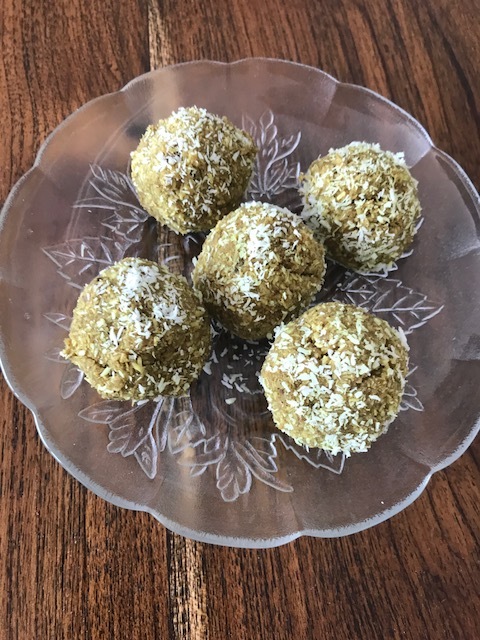 Sprinkle extra desiccated coconut on a flat surface and roll each ball in a little more coconut. Allow to set in the freezer for 30 minutes. Store in the fridge for as long as a week in an airtight container. To read more about matcha check out my previous post. And over on Zen Green Tea’s website you’ll find lots more matcha madness including a lovely recipe for Iced Turmeric Matcha Tea. 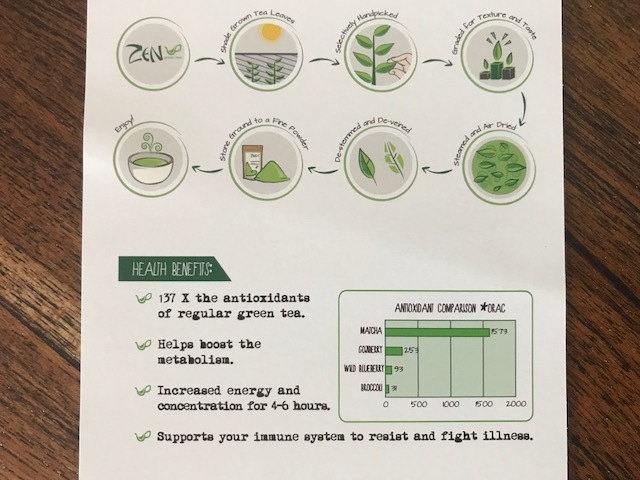 Zen Green Tea kindly sent me samples of their Japanese matcha to help me draft this post. Find out more and check out Matcha recipe ideas at Zen Green Matcha Tea. 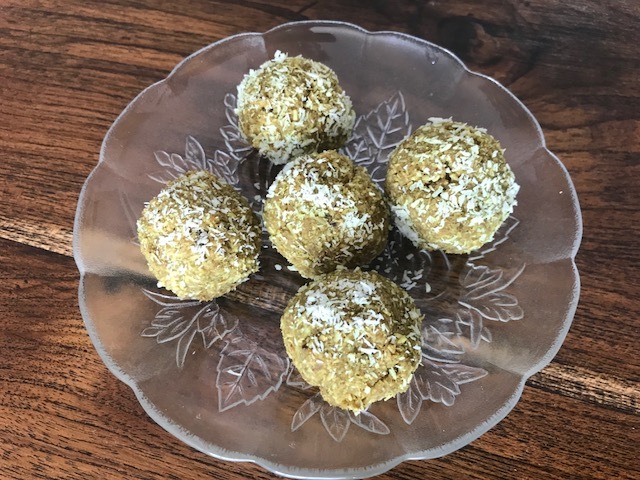 Tags: balls, coconut, matcha, recipe. Bookmark the permalink. Wow Laura, super nutritious and they sound super delicious too! Hope the move goes smoothly for you! Thanks so much Annika – we finished the matcha balls yesterday in the midst of packing and they were great. I’ll be making them again very soon….. Wonderful nutritious balls. Great snack idea. Awesome balls loaded with nutrients ! Wonderful idea to use coconut a perfect complement for matcha !! 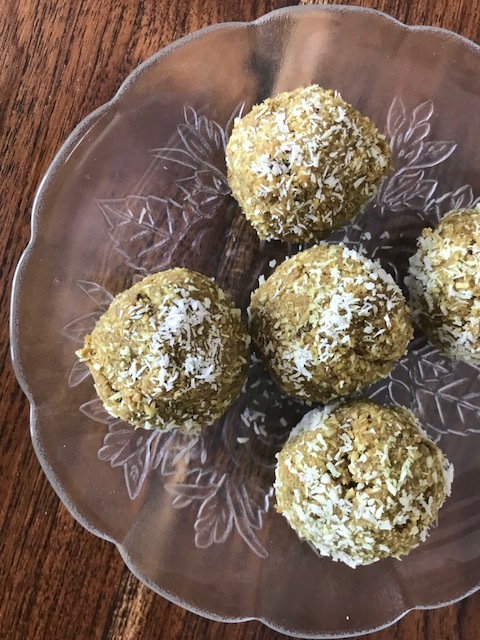 Hi Megala – coconut and matcha work really well – there are loads of other recipes that pair them too – here I added an extra fibre boost with the other ingredients! Thank you – yes matcha is becoming so popular and it’s so good hat it’s versatility goes beyond making tea! These sound so interesting, Laura. Turmeric? But what a fabulous idea. I can’t say I’ve used matcha in my cooking before but I’m definitely keen to now. They look delicious. This looks absolutely fantastic! Always looking to get some nutritious goodness into my family . Thanks for this new way! Thanks for the feedback and I’m glad you like the recipe! Fun post! I did NOT know all that about Matcha – I know it’s been trendy for awhile. I’m going to have to do a little more thinking about it!! Hi Mollie – I’m sure you’d be able to incorporate it into some of your recipes in a unique way…..
Yumm these sound delicious! Such a great snack! Thank you – they are!